Interesting hybrid between two Mexican Oranges and wow, you get an incredible shrub that adores this climate. Rounded evergreen shrub to 5′ x 5′ after 6 years. In spring (and again in autumn) the whole bush becomes a cloud of fragrant white blossoms. They show up well with the finely divided leaves. 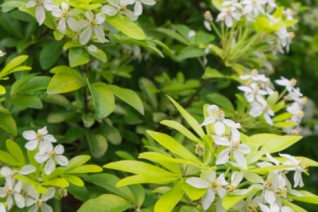 Easy to grow shrub that is very forgiving. Drought tolerant when established and it has been hardy to near 0ºF. It takes very well to pruning which will increase both the shrubs density but the amount of flowers as well. The palmate leaves look like thin fingers or even bamboo especially as it becomes dense and layered. Moderate deer resistance. Perfectly adapted to the climate of Western Oregon. Full sun to part shade. Any reasonably well drained soil. Gold leaved Mexican orange is a durable fine textured evergreen shrub to light up landscapes. 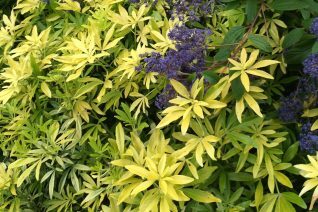 The vivid foliage is wonderful year round and the clusters of white fragrant spring and again in autumn flowers are a delight. Full sun to part shade. Avoid reflected heat if in full sun. Rich, well drained soil and light summer water. To 4′ x 4′ in 5 years. Larger in richer soil. It may be hard pruned in late winter to resize/regrow fresh new leaves. Moderate deer resistance. Cold hardy to 5ºF. Avoid direct exposure to subfreezing winds in areas that are vulnerable. Long lived trouble free shrub. Excellent hybrid Mexican Orange selected for glowing golden foliage. The finely divided palmate leaves have the fine texture of bamboo. Tolerates full sun and becomes deeper green and less dense in more shade. 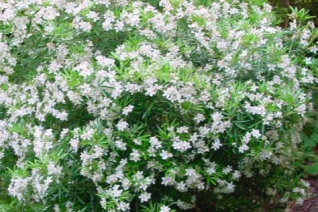 In March and again in November fragrant clusters of pure white flowers appear. Drought tolerant when established but summer irrigation tolerant as well. Nice clipped hedge (not sheared but thoughtfully clipped) to let the patterns of the leaves layer and reveal themselves. Moderately deer resistant. To 4′ x 5′ in 5 years.